Super-featherweight boxer Josh Holmes says that the excitement is kicking in ahead of his first ringwalk as a professional in the sport. The 23-year-old has been picturing this moment in his head for a considerable amount of time but tomorrow, at King George’s Hall in Blackburn, the dream will become reality. Holmes, who hails from Earby, will make his big entrance to ‘One Step Beyond’ by The Madness, a song choice that will undoubtedly animate the crowd. “This moment will definitely top the lot,” he said. “I’ve sold 150 tickets so there’ll be a big, noisy crowd coming along to support me. It’s exciting. When that music plays and I start making my way to the ring it’s going to be good. “It’s going to be surreal because I’ve pictured it for years. I’ve got to embrace it, you only get one debut so you’ve got to enjoy it as well. “Winning is very important. If you lose your first professional fight then it’s not a very good start. I’ve got to put on a good show and I’m confident that I will. The two-time Yorkshire Area champion, who embarked on a two-and-a-half year winning streak as an amateur, will face durable journeyman Naheem Chaudhry in his inaugural contest in the pro ranks. 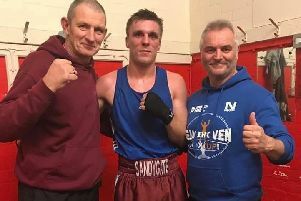 Holmes, who was also crowned England Senior Development champion following victory over London titlist Jerome Campbell at Grantham Meres Leisure Centre in 2016, is confident of inflicting his opponent’s 41st career defeat. “The excitement is kicking in, fight week has finally arrived,” he said. “It’s been a long wait really. I’ve always wanted to turn professional and now is the time. “It’s a big moment but I don’t really suffer from nerves. I feel ready, I’ve prepared very well. I came to Rob at the beginning of January so it’s been flat out since then. Holmes added: “I don’t really know much about him. I’ve seen videos of him. I don’t think he’s going to cause too many troubles at all but you never know. It’s boxing so you can’t switch off. “He’s never been knocked out, they’re tough lads these journeymen and they’re there to not be stopped. They are there to hold their own. Training out of the famous Phoenix Camp in Denton - the facility born out of Bobby Rimmer’s original institution which spawned Ricky Hatton - Holmes spends his days rubbing shoulders with the likes of Brian Rose, Ryan Doyle, Jack Massey and Charlie Schofield. Holmes, the new kid in class, is enjoying his education in a school that has housed champions. He’s among a stable packed with experience and know-how and that suits Holmes down to the ground. “It’s a totally different style; I’m being made to relax more, sit on my shots, and not to rush in to it,” he said. “In the amateurs I was aggressive, chasing them around the ring and trying to knock them out. You can’t do that in the pros. “You’ve got to relax, pick your shots and enjoy it. It’s more like a game of chess. In the amateurs it’s three three-minute rounds where you give it everything you’ve got. Now I need to settle down. “My style has changed, definitely. I’ve noticed a big difference compared to the amateurs. “I frustrate opponents. I’ve been sparring some very good kids and they’ve told me that I frustrate them. I’ve been sparring Ryan Doyle, who is a strong puncher, and Aqib Fiaz, an ex Team GB boxer. I held my own with him so I’m confident in my ability. Josh would like to thank Hippo Motor Group, Sandy Lane Deli, Skipton Self Drive, Palmbeck Plumbing and Heating, Green’s Masonry Ltd, M.A. Shaw Building Contractors, Salterforth Nurseries and Garden Centre Ltd, JH Grooming and Earby Fitness Mill for their ongoing sponsorship and support.